Join us on one of the best experience you will ever have! There are many speed boat tours but none like Blue World Safaris. 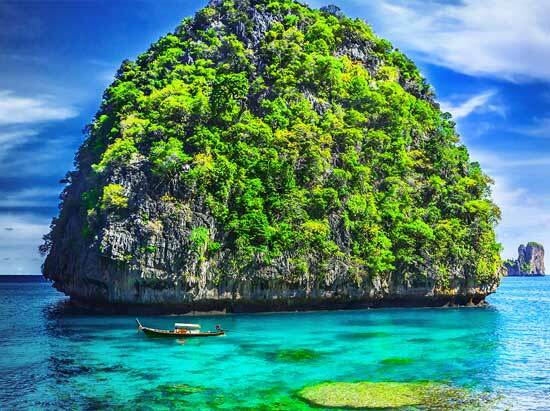 Join our Tour to Phi Phi Island and get some amazing stories to tell your friends and family. It will be one awesome adventure that you will never forget. Have a look at our scheduled of a typical day out with Blue World Safaris. The adventure starts straight away with a visit to the beautiful beach at Maya Bay, made famous by the Leonardo DiCaprio Movie “The Beach“. Plenty to explore here or just enjoy the white sand beach or swim and snorkel. From here we sail between the stunning cliffs of Loh Sama Channel Next is Bida Nok the most beautiful dive site in the area; here the water is usually incredibly clear and all kinds of fish and coral can be seen and also the occasional turtle. This is a short stop of just 45 minutes. The adventurous can join our guide to a special place for a snorkel swim with Black Tip Reef Sharks, these sharks are timid and not dangerous but will be sure to set your pulses racing. Great for the family album. 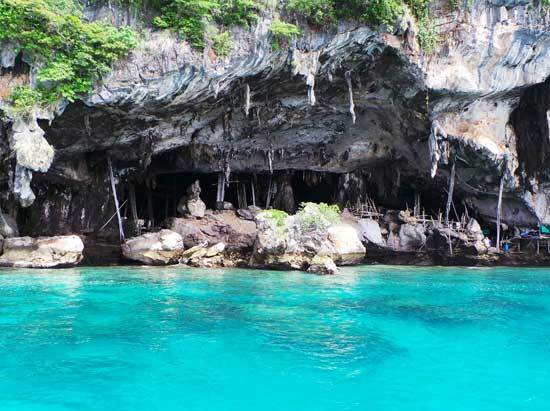 Then you’re on our way to Viking Cave on Phi Phi Leh for a photo stop and to see where the local people harvest the swallow’s nests for that incredibly expensive dish, bird’s nest soup. 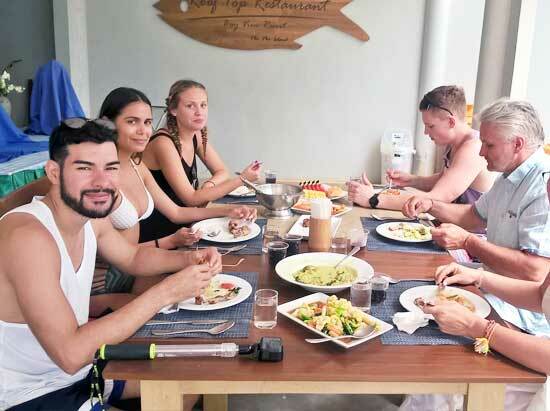 A delicious hot buffet lunch is served at 1pm at a restaurant on Phi Phi Don and there is time here to enjoy the beach and swim. 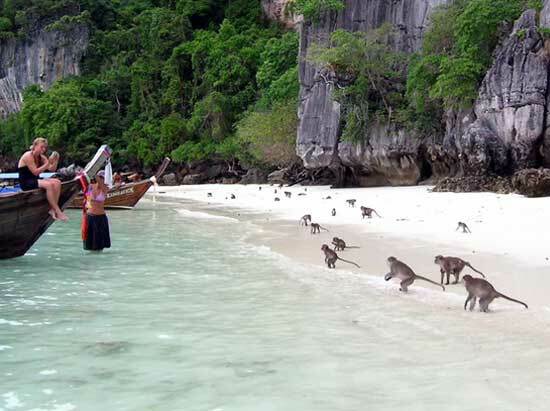 After this we go to Monkey Beach where you can look at the monkeys on the beach or snorkel. The monkeys can be quite mischievous so please take the advice of our guide and not feed or try to pet them. After this we arrive back at Ao Po at 4:30pm where your air-conditioned minivans are waiting to whisk you back to your hotel. 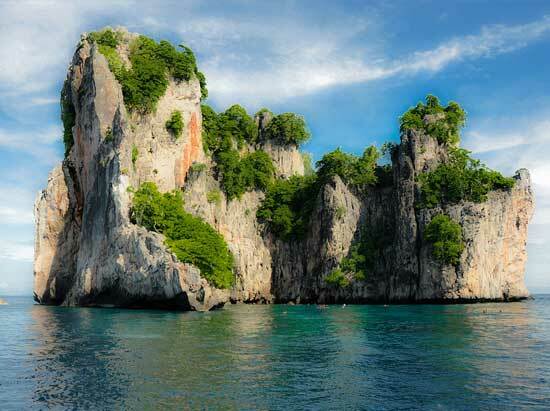 The itinerary may change to suit tides and sea conditions but there are many wonderful alternatives at Phi Phi. The tour is not suitable for ages over 70 and under 1 year or for pregnant ladies and people with back problems or other disabilities – please ask for details. Things to bring Towels Swim Suits, Sun Cream Sun Glasses, Hats etc Camera Personal Medication Please feel free to bring your own snorkel equipment if you prefer. Anchor in sheltered bays, enjoy a gourmet lunch (optional), explore beautiful islands, sink your feet into white sand beaches and snorkel on shallow coral reefs that are teaming with colour and tropical marine life. Explore enchanting coves, caves and secluded beaches. Each kayak seats 2 adults and one child. Why not take snorkelling one step further and enjoy the magic of the underwater world on a one to one dive experience on a shallow coral reef with one of our certified instructors. Please book in advance. A limited number of divers can be accommodated on each charter at an extra charge. Please book in advance.